We’d made it barely 10 minutes up Lost Dog Wash Trailhead when we found a section flooded. Water streamed across the trail, down from the mountains and toward the suburb. My wife and I hopped over it, precariously, crunching bits of ice frozen on the dirt. After we crossed, I heard someone behind us—a twenty-something bro snapping photos with his phone. 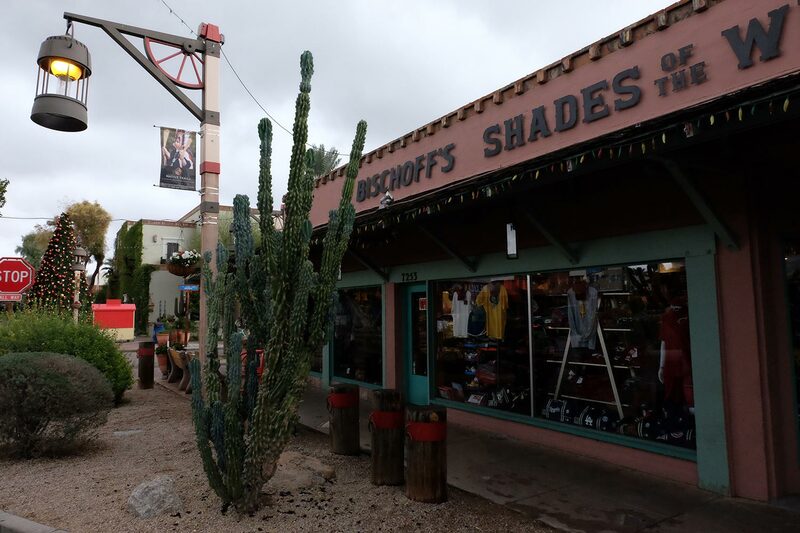 Old Town Scottsdale is rife with these kitschy, fun storefronts. Scottsdale, at least, wasn’t too flooded. The suburb is known as Phoenix’s high-end arts district, a dominantly wealthy neighbourhood with well-kept recreational trails and enough golf courses and palm trees to make you think you’re in California. It’s also one of the only truly walkable neighbourhoods in the Phoenix area, and—come hellishly hot sun or high frozen water—we were determined to walk around. We drove out from our hotel, the Scottsdale Resort at McCormick Ranch, conveniently located a few minutes’ drive north on the main street of Scottsdale Road. With a towering entry fountain and footbridge arching over the swimming pool, it looks appropriately opulent in Scottsdale, though it’s also a fair bit more affordable than most nearby resorts. 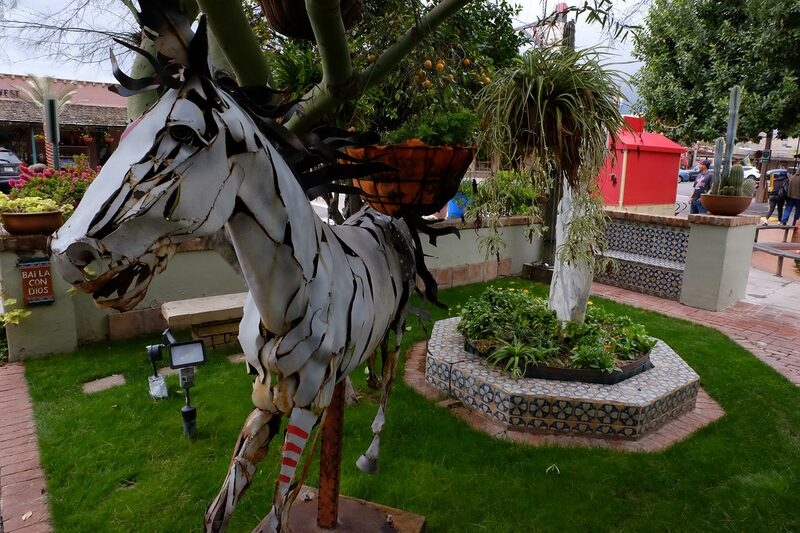 Scottsdale is rife with public art—especially of horses. We’d heard good things about the local art scene, but the famed Scottsdale Museum of Contemporary Art was closed for New Year’s, along with most of the local galleries. The only one we found that was open was called American Fine Art, and it just so happened to house dozens of originals by Pablo Picasso, Andy Warhol and Norman Rockwell. “You’ll never find a collection of Rockwells like this for sale anywhere else in the world,” the shopkeeper boasted to us. Then, realizing we had neither the money nor knowledge to spend thousands on a Rockwell sketch, politely smiled and moved onto older, better dressed patrons. On the west side of Scottsdale Road, opposite the Old Town, is the modern arts district, which sprawls out from 5th Avenue. It’s relieving to see that at least somewhere in Phoenix, people realized the value of urban density—5th Avenue is one of the most active, lively parts of the city, with funky shops, cafés, horse statues and fountains abound. We regrouped at the Scottsdale Resort before driving north to Taliesen West, once Frank Lloyd Wright’s scenic mountain home, now an architecture campus and quasi-museum. It’s a secluded, long-lined, flat getaway made of red desert stones and broad wooden beams—a masterwork of organic architecture, all red, orange, brown and beige, defining what we know today as the colours of the Southwest. 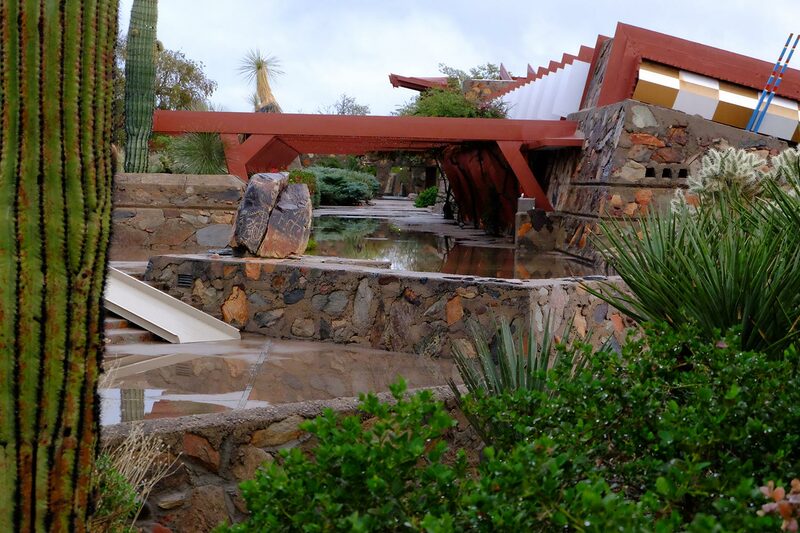 Taliesen West floods when it rains. Dejected again, and with only two hours of sunlight left in the day, we drove 10 minutes east to Lost Dog Wash Trailhead near the northern mountain range—nature, at least, couldn’t close for the holiday. We hopped the gushing river that’s never usually there, smiled politely at the fascinated bro and continued up the gentle mountain trails for another hour before circling and heading back. The trail was almost completely deserted, save for a few hikers and trail runners. 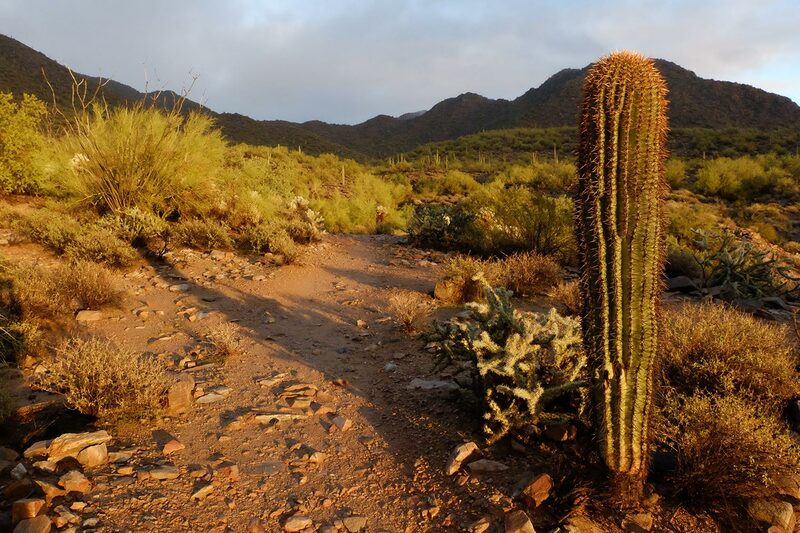 The rocky grounds are covered by yellow poppies, lavender lupine, and an army of cacti: red-tipped barrels, fuzzy cholla, towering saguaros. It’s just as beautiful with the city limits below in the distance as it is when you can no longer see them, surrounded as you are by rugged stones and cawing birds, multitudes of flora and the rustling of a cool evening breeze. The sun casts an orange glow over the cacti. With only 30 minutes before sundown, when the parking lot would lock us in for the night, we found ourselves delayed, over and over, by the golden light of the sun. As the orb squeezed between the sliver between the clouds and mountains, it cast an incredible incandescent glow across the landscape, reflecting onto the muddy trail and drenching the horizon in apocalyptic heat. Nowhere else—not in any desert, forest or beach—have I seen a sunset that powerful. And while we wanted to stop and feel grateful for the rain, and for the delays that brought us to the mountains at that perfect moment, we instead had to race toward the car and speed out before the parking-lot gates closed for the night. 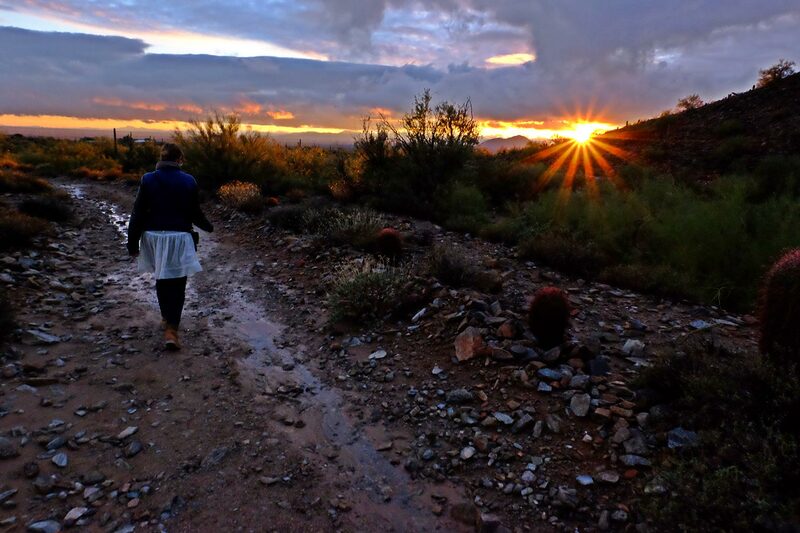 The sun sets over Lost Dog Wash Trailhead in Scottsdale, AZ.